Brief Also known as Chittar Palace, this monument is divided into three areas, namely a heritage hotel, museum and the Maharaja’s royal residence. Extra Umaid Bhawan Palace is one of the most exclusive hotels of Jodhpur. Facts Visit the museum to see royal artifacts and armor, old clocks, glassware and other miniatures that are on display. People Love For Place It is an architectural marvel and offers modern facilities for a royal experience. Tips Do visit the museum in this palace to get inside visit to the history of this place. People Love For Place It has numerous play ground around it to sit n relax. Facts The reason behind the construction of this gate was commemorating the triumph of Marwar against rival dynasties of Bikaner and Jaipur. Tips Avoid visit in the hot sun. 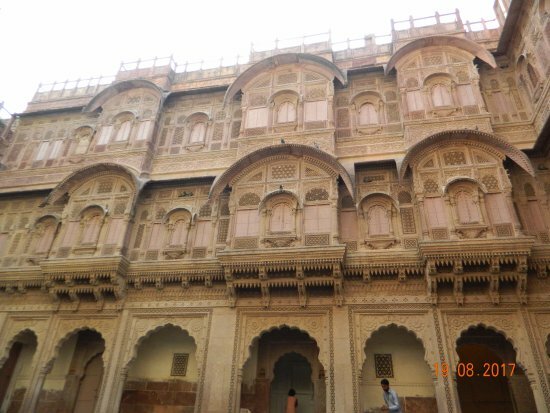 Brief This imposing edifice was built in 1488 by Rao Hammir Narawat, the grandson of Rao Suja Maharaja of Jodhpur. Extra The fort reflects the fine work of artists of Marwar of the bygone era. People Love For Place This place reflects the Marwar Culture and Architecture. Extra Within the fort premises, there is another zenana court towards the south, lying adjacent to the Moti Vilas. Facts Zenana Mahal, the erstwhile royal abode of Jodhpur queens, is an integral part of the majestic Mehrangarh Fort. Facts This white marble wonder of Rajasthan is often called the Taj Mahal of Marwar. Brief Situated 120 meters high above the ‘Blue City’ of Jodhpur, the fort is one of the most magnificent and best preserved forts in India. Tips One can use the life facility available in the fort as well.